UPDATE 3.40PM: Noosa hinterland homes have been battered by hail this afternoon after an intense storm system rolled through the region. 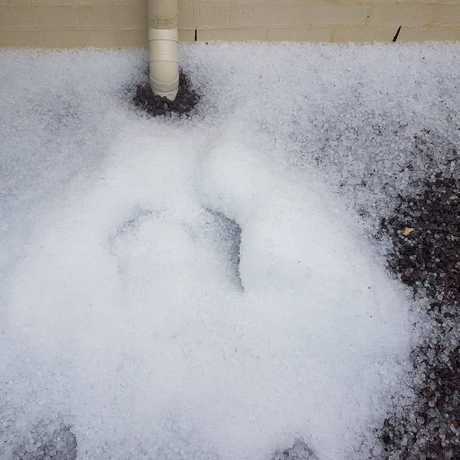 Residents of Cooroy and Eerwah Vale copped a blast of hail while heavy downpours were reported in Cooroibah and Boreen Point. Between 2pm-3pm 28mm of rain fell in Mapleton, while 17mm fell in Eerwah Vale and 16mm was dumped at the Baroon boat ramp site. Cooroy storm: Cooroy copped a typical Spring storm this afternoon...Emerald St became a small creek for about 15mins. 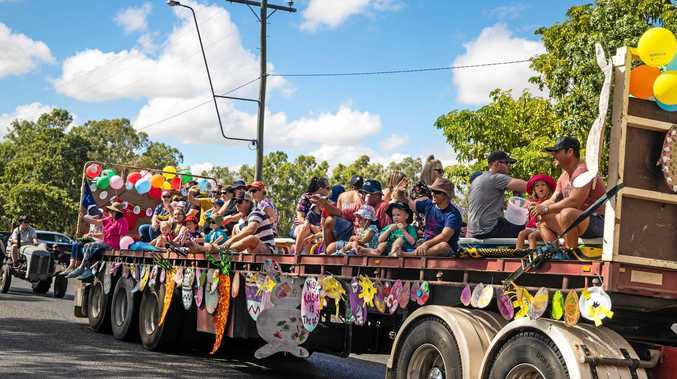 Video via Noosa Regional Realty. UPDATE 3.05PM: Noosa Heads is in the firing line of what is being described by forecasters as a "very dangerous" thunderstorm. The warning was issued just before 3pm after the thunderstorms were spotted southwest of Noosa Heads, moving north. The Bureau has warned "destructive winds, very large hailstones and heavy rainfall" which could lead to flash flooding were all "likely". The storms were set to hit Noosa Heads by 3.25pm and Lake Cooloola by 3.55pm. Higgins Storm Chasing has declared a supercell alert for the north-moving storm cells. WARNING: The Bureau of Meteorology has issued this warning. UPDATE 2.06PM: The Bureau of Meteorology has advised central Sunshine Coast areas to brace for heavy rain which may cause flash flooding and large hailstones over the next few hours as severe thunderstorms arrive. Maleny and surrounding suburbs copped the brunt of them, but the system has moved into coastal areas and damaging winds are also expected. Maroochydore and surrounding suburbs are the next suburbs to feel the brunt of the storms, which dumped 15mm of rain in the last hour on Maleny and Conondale. UPDATE 1.55PM: Maleny and hinterland suburbs are feeling the force of intense storm cells making their way towards the coastline. 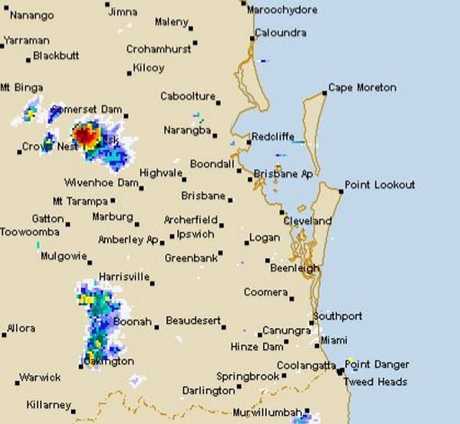 The storms, which generated in the southwest, have been rolling towards the Sunshine Coast and were currently hitting Maleny and surround suburbs, as they moved towards Nambour and the coastline. More storms had been identified near Oakey and were making their way northeast. EARLIER: Residents have been warned to brace for severe thunderstorms, flash flooding and large hailstones, as severe thunderstorms sweep towards the Sunshine Coast. The Bureau of Meteorology issued a warning just before midday for regions and suburbs, including Nambour, which may be affected by the severe storms. The storms were spotted southwest of Toogoolawah and were making their way towards the coastline. "Severe thunderstorms are likely to produce damaging winds, heavy rainfall that may lead to flash flooding and large hailstones in the warning area over the next several hours," the Bureau advised. 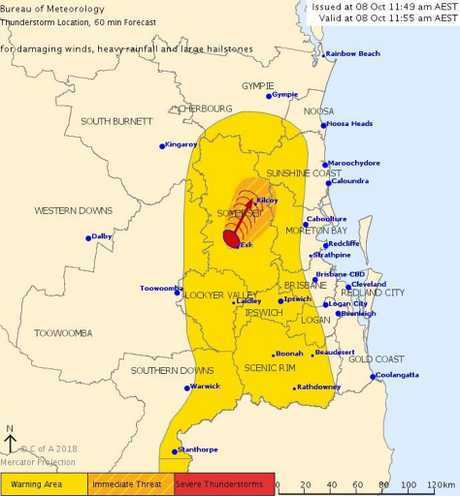 The storms were expected to be hitting Kilcoy just before 1pm. The next warning was due to be issued at 2.50pm, updating how the storms were progressing.